All you need is an opportunity. New Zealand's women's hockey coach Mark Hager had his 20 years ago, when the Maryborough born striker won a bronze medal for the Australian Kookaburras at the Atlanta Olympics in 1996. On Thursday, Maryborough's second Black Sticks export, Grace O'Hanlon, took hers with both hands - and it delivered a Commonwealth Games gold medal. O'Hanlon was the woman on the spot when New Zealand defeated England in a penalty shootout. 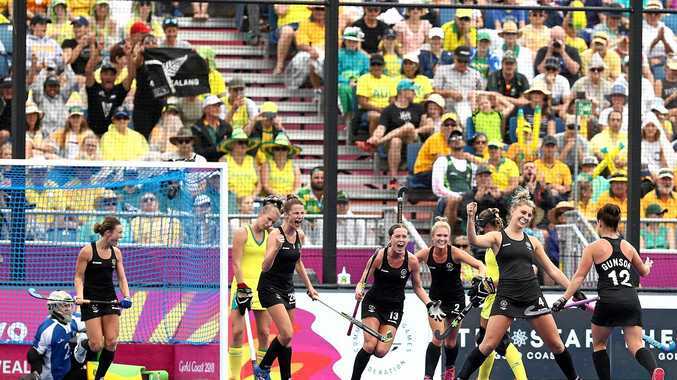 The penalty specialist saved four strikes, and when the Black Sticks' Stacey Michelson found the net with the fifth shot New Zealand's fans went ballistic. O'Hanlon, the 25-year-old Maryborough Brothers junior who qualifies for the Black Sticks through her father and moved to Auckland in early 2017, told media after the game her success was due to her relentless preparation. She didn't have a role to play in Saturday's gold medal match, as the Black Sticks sealed a 4-1 win against the Hockeyroos. Black Sticks veteran Sally Rutherford was enormous in goal as the New Zealanders rediscovered their scoring ability. After 18 goals in the first two games, the Black Sticks went 200 minutes without a goal in regulation time. The Hockeyroos, meanwhile, did not concede a goal in their four pool games and 1-0 semi final win against India. For Hager's Black Sticks, it ends a decade-long drought. They fell to Australia in the final at the 2010 Delhi Games, and were left with bronze at Glasgow in 2014. They finished fourth at the Olympics in 2012 and 2016, and were runners-up in the World Hockey League last year. Now, they are Commonwealth Games champions.